Together’s Vitamin D3 is made with nutritional yeast and includes natural metabolites which are essential for Vitamin D absorption. Yeast concentrate* providing Vitamin D3, Vegicap (Vegetable cellulose). *An inactive non-candida yeast. No known allergic reactions. Take one capsule daily as a food supplement with or without food, or as directed by a practitioner. 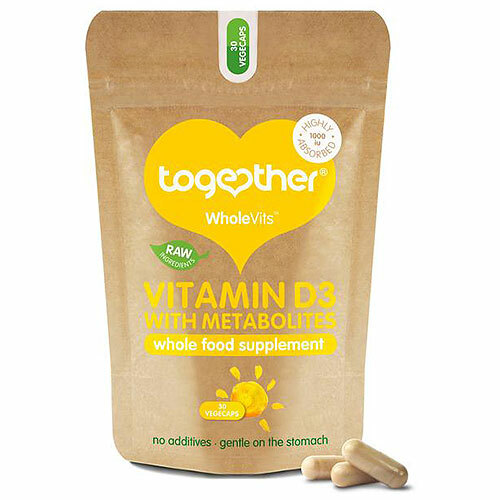 Below are reviews of Together Vitamin D3 with Metabolites - 30 Capsules by bodykind customers. If you have tried this product we'd love to hear what you think so please leave a review. Great product, I have been taking these capsules for quite some time now. I take 2 per day in the winter and 1 per day during the summer months. I feel much better since starting them. We have been taking these for several months after switching from a different brand. We are pleased with the quality, ingredients and minimal packaging. Excellent vegetarian supplement, the best I have come across at a great price and as always the service was very good, thank you! !